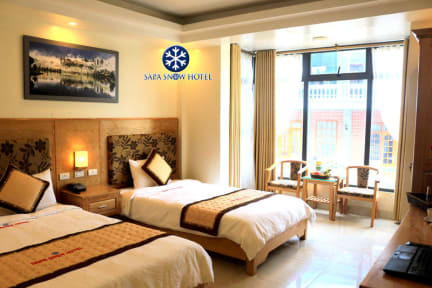 Sapa Snow hotel is located on a quiet street in Sapa center, only 50m to the supermarket, 130m to Sapa lake, 4 to 5 minutes walking to Sapa old stoned church & square, Ham Rong Mountain, 300m from the bus station, the market, 3.5 km from Fansipan Cable Car Station, easy to reach to beautiful villages with minorities & rice terraces. We have 30 equipped rooms & all guest rooms at the hotel are fitted with a seating area, a flat-screen TV with satellite channels and private bathroom with nice standing shower, hairdryer, toiletries & minibar, etc. We have a big restaurant & café on the first floor serving Vietnamese, Asian/ Western foods, and drinks. It opens 24/7. 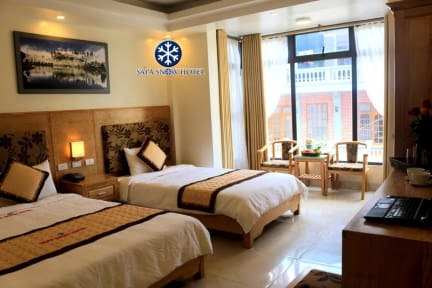 Our hotel manager & staffs from villages speak English, Vietnamese & H’mong languages will support you with all our best hopefully you will have an unforgettable time in Sapa on your vacation or business trip. We can also arrange for your train or bus from other cities to Sapa & vice versa.